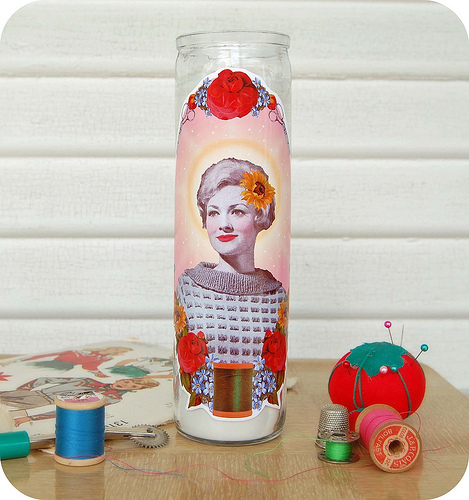 I came across these amazing Patron Saint candles on dear Amanda's blog today and I've decided that I must save my pennies to gift myself this Patron Saint of Sewing Prayer Candle as a housewarming gift. I have so many sewing projects in the works that need to be finished before the baby arrives. Holly and her blog Sweetheartville are inspiration enough but this St. Helene candle is just the perk me up I need to get to sewing. I think what I love most about this candle is that it reminds me of one of my favorite burlesque stars, La Cholita. Eeek! Thank you so much for the sweet feature on your lovely blog! I'm so glad to have found your pretty little corner of the internet. You and your sweet blog are adorable. I feel so lucky to have found out about you from Amanda. I can't wait to order my special candle. this candle and YOU are fabulous!!! ahhh what a gorgeous piece of art.